David Fisher is the founder and CEO of Integra Ledger, a permissioned blockchain for the global legal industry that facilitates secure and efficient interoperability among law firms and their clients. It is designed to meet the special requirements of the legal industry, using distributed ledger technology to provide highly secure, private, and redundant access to information, as well as highly defined ownership and access rights to communications, documents, data, contracts, and smart contracts between and among law firms, clients, and invited third parties. David Fisher, Dean Sonderegger, Brian Kuhn, and Katherine Lowry talk about what's going on with the state of blockchain technology and their prediction in the coming years. David Fisher and Dera Nevin talk about how they used the #ToTheMars Tour to build community and connect groups working on similar products. 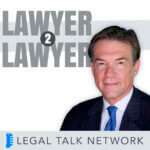 David Fisher talks about what blockchain is and its application in the legal industry.